Yesterday, I was going through a bunch of old pictures on my phone and it brought back some good memories and nostalgia, so I thought I would share some of my pictures and stories with you!! 1. 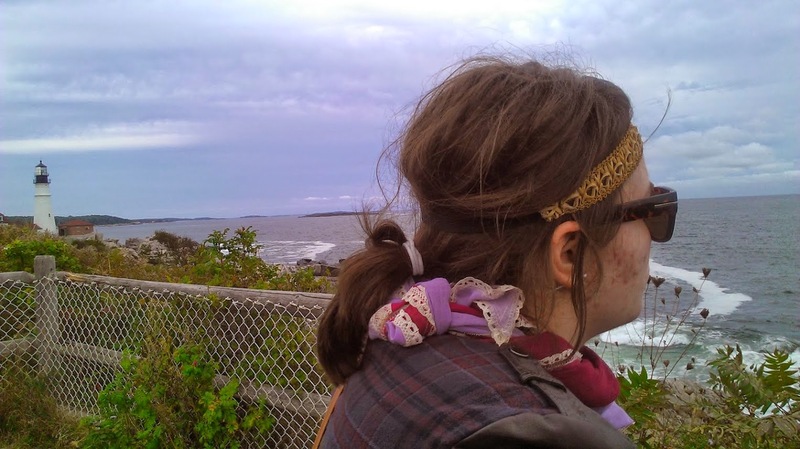 For my 24th birthday Mona and I took a last minute trip to Maine (this was before I started blogging otherwise I would have told you about it). This is Mona with the Portland Head Light Lighthouse in the background. 2. 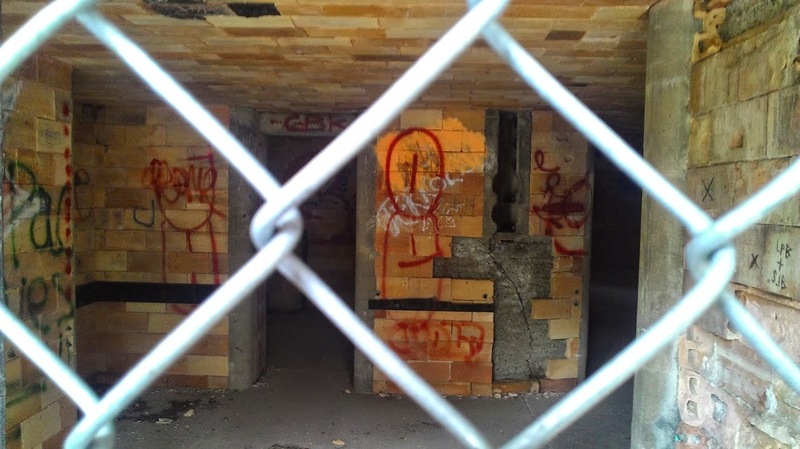 This is an old army base in Maine, they had it all locked up, but it was cool to walk around and look at all the in the old buildings. Obviously, someone broke into this one and redecorated. 3. Same army base. 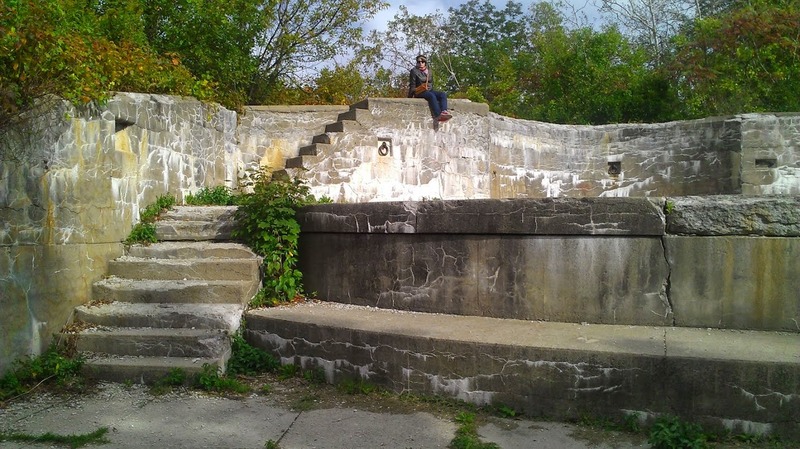 This is Mona sitting in one of the old gun holders? Is that what you would call them? There is a big hole with stairs and they used to put big guns in the hole, so "gun holder" makes sense? It's a cool picture...we'll just leave it at that. 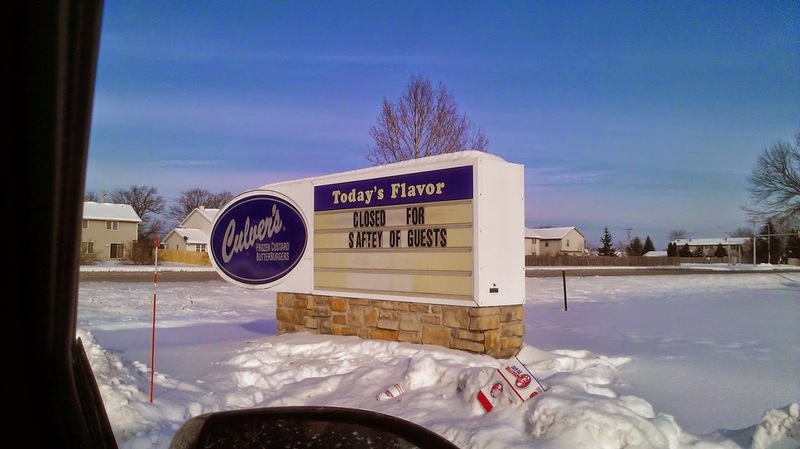 4.Mona and I were a little concerned when we came upon this Culver's, I think it was in the Green Bay or Appleton area? We wanted to know why were we in danger? Turns out it was only a water main break, another restaurant that was still open and using bottled water let us know. 6. This is how I watch ALL sporting events on television. Reading a book. 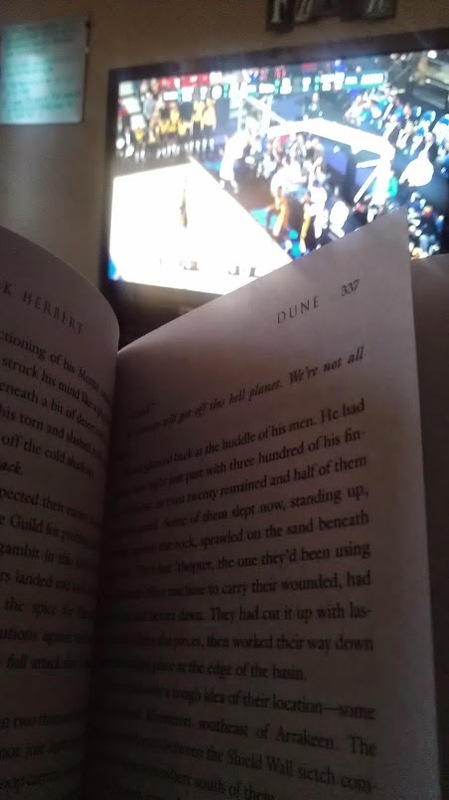 I'm a HUGE sports fan...not. 7. This is Mona in fear for her life. We were walking out a long pier in Sheboygan, WI off of Lake Michigan to get to a lighthouse at the end. It was rather windy and the waves were pretty high. She was so afraid of the crashing waves knocking her off the pier that she hit the deck and held on for dear life. She survived. 8. 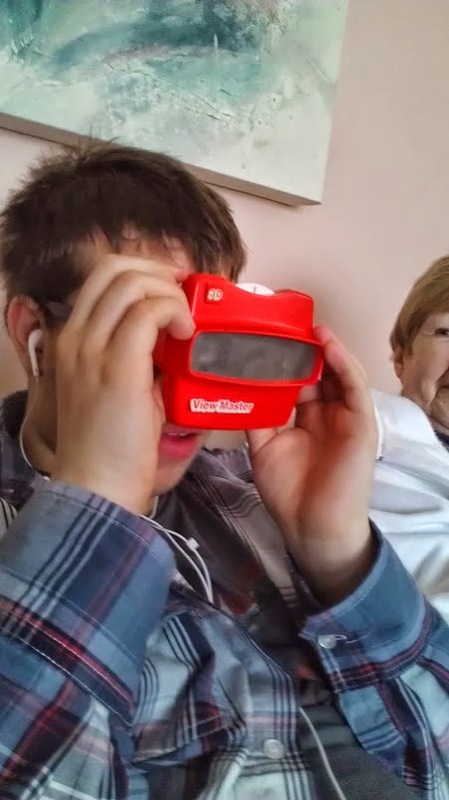 My Cousin with a View-Master. Need I say more? 9. 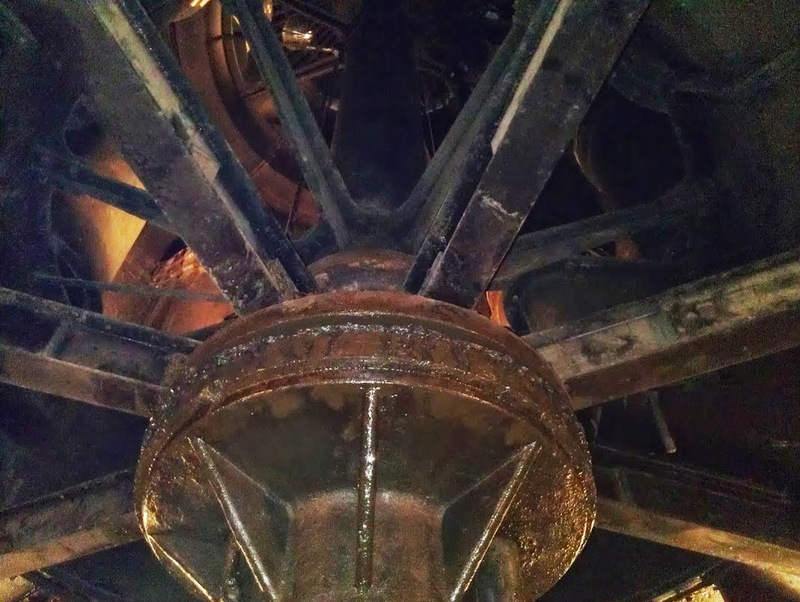 This is the gear shaft for a revolving jail! My family was on our way to or from Nashville and I saw this museum in the hotel guide. I told them I refused to leave until we went. Mom wasn't enthralled with the idea, but I refused to budge. And it was awesome! They put prisoners in this big room with a round cage separated into different cells that had only one door in or out that opened to only one cell at a time. The jailers would turn the crank to open it to the prisoner they were looking for. They used this concept for added security. Unfortunately, revolving jails are no longer in use because they were deemed a fire hazard and because too many prisoners were losing limbs and heads when the jail would rotate and they had body parts sticking out of the bars. I love weird Museums. I've been trying to talk Mona into going to an old psyche hospital Museum in Indiana, that is supposedly haunted, but for some reason she keeps saying no. 10. 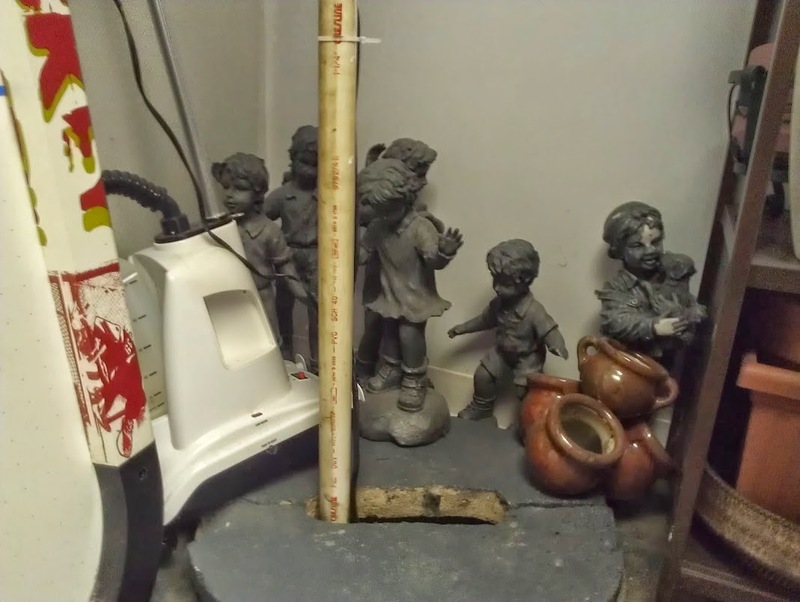 Creepy little children statues I found in my grandmother's basement that reminded me of the Weeping Angles from Doctor Who. Let's say I walked out of there backwards without blinking. 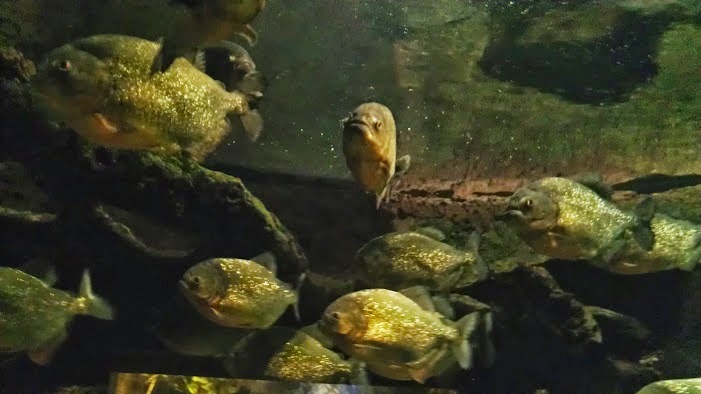 "Every fish has a little Piranha in them." Yes, Mona, my goldfish could rip the flesh off you at any moment. 12. Last year when I went to leave our apartment one morning I found a snowman left on our front porch (see picture on left). This was right after the Doctor Who Snowman Christmas Special, so obviously thought it was the Great Intelligence at work! 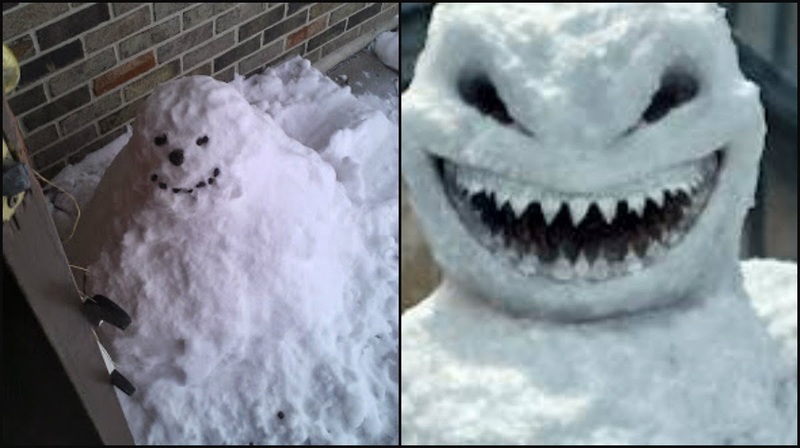 I went around telling everyone it was a Doctor Who Snowman (see right) that it was after me! Nobody seemed to believe me. 13. The is from the time my friend Kate asked Becky and I to go with her on a date. She had met the guy on an online dating site, but she was worried about getting kidnapped and murdered, so she wanted us to tag along and call the police if anything fishy happened. Becky and I jumped at the opportunity! Mona pouted, because she had to work. 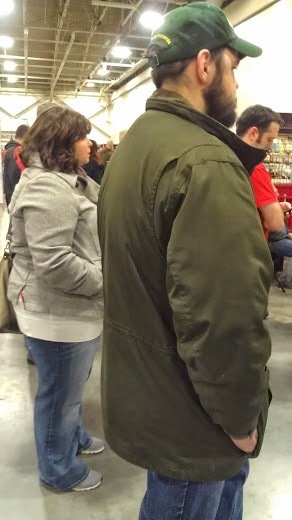 The date was at a woodworking convention in Milwaukee. BEST DATE EVER!! At least for Becky and I, Kate didn't like it so much...I mean just look at the distance between the two of them! After a while Kate made a dash to the bathroom, we followed see if she needed us to come to her rescue. She was ready for the date to be done. Little did we know that Becky's sister, who showed up moments before to join the fun, was talking to the poor guy. He was telling her that on his last online date the girl went to the bathroom and just never came back. She offered to go check on his date for him she felt so bad for him. We didn't let Kate just ditch him through the bathroom window, we made her man up and go tell him it wasn't going anywhere. Then we went out for margaritas. 14. 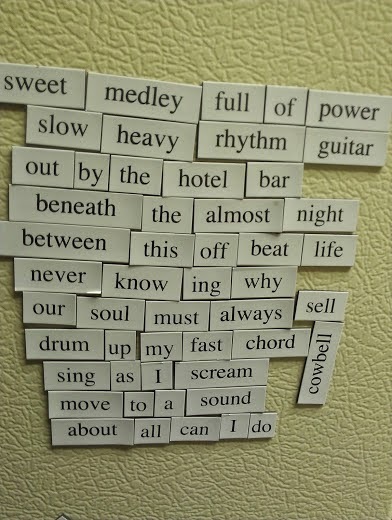 A lovely poem I wrote with magnets we got from the Rock and Roll Hall of Fame. I'm not quite sure where "cowbell" fits in, so just use your imagination. 15. 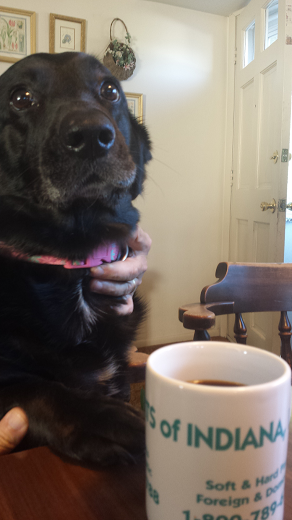 My baby, Minnow, sitting at the table drinking coffee. She takes after me with her love of coffee! It's hard to get a good picture of what she really looks like...from here you would think she is a black lab, but this is not the case. She may have the body of a black lab, but she has the legs of a basset hound. She basically looks a giant winner dog. Some people call her weird looking and then I never talk to them again. 16. 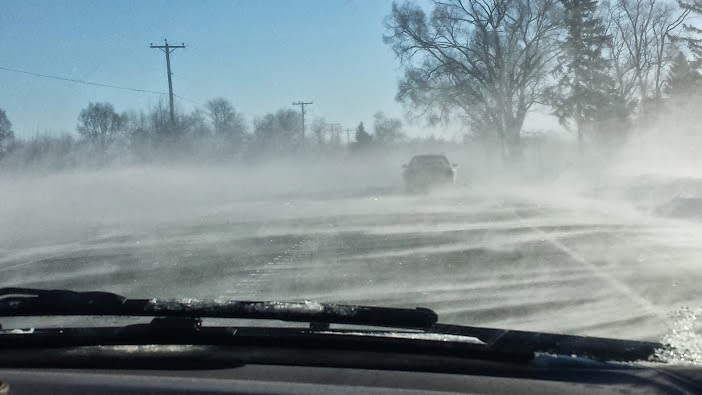 This is what it looks like when you drive on highways surrounded by cornfields in the middle of a Wisconsin winter. Not cool Wisconsin. Dad wanted me to send this picture to Mom as we were driving, but I told him I wasn't crazy! I will show her when the snow is gone. 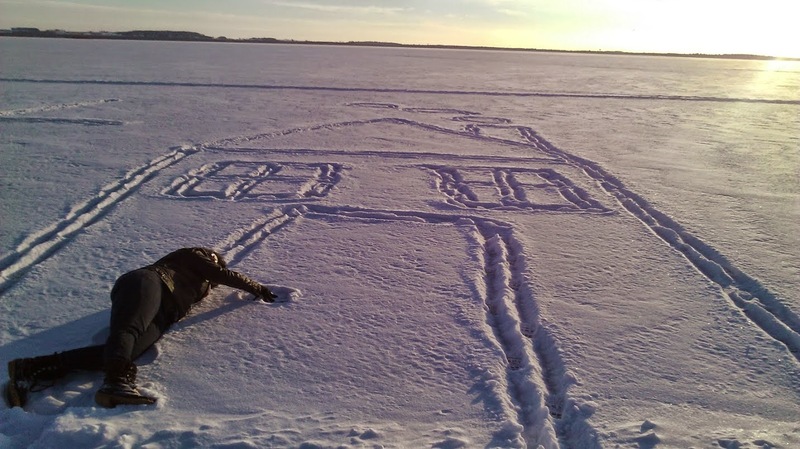 Well, the snow is gone so here you go Mom! Good news...we survived without incident or else you would have heard by now. 17. 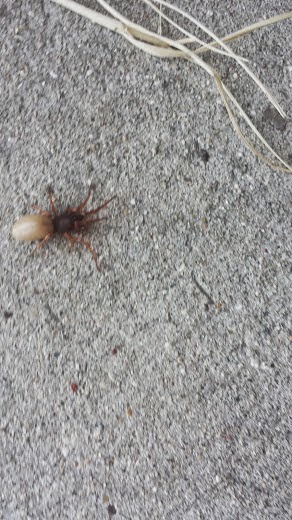 This cool looking spider Mona found hidden in her clothes in the basement. Mona didn't like it so much at the time...well actually she still doesn't like it, she almost threw up when I just showed her this picture. Way to hold a grudge. 18. 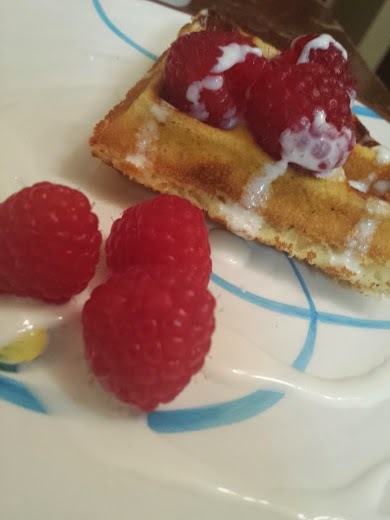 Awesome homemade French waffles! Mom has this group going where a bunch of people make French recipes and share pictures on Facebook every month. I told her I wouldn't do it, because who wants to cook that often? But a bunch of my friends got together to do it together, so it was okay. And, like I said, they were awesome. 19. My green thumb at work. 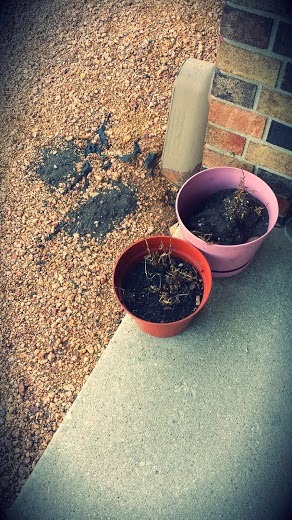 Sadly the winter was not kind to my poor plants...nor was the summer. I think it was just because Mona kicked them over..look at that dirt on the ground! That was from the pots! 20. One day last summer, Mona and I decided that we were going to become birdwatchers. We downloaded a bird app, dressed in our outdoors like gear, went and bought binoculars, and stopped at Starbucks (you can't go bird watching without coffee). 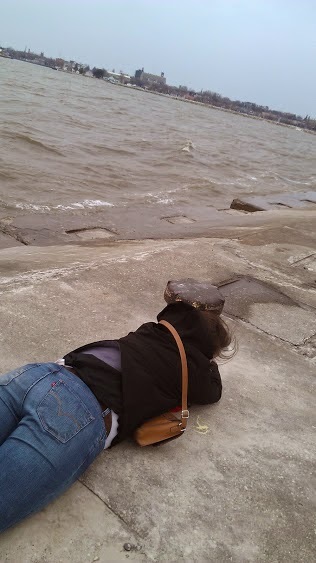 This picture was the result of our excursion. Do you know how hard it is to be a birdwatcher?!? Trying to look through those tiny binocular holes while locating the bird you just saw with your real eyes is VERY difficult. Plus it's hard to hold coffee and look through binoculars at the same time. 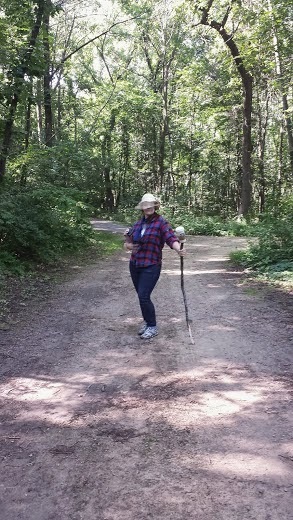 Once Mona was done with her coffee she put the Starbucks cup on the end of the walking stick she picked up...as you can see from the picture. We were out watching for hours. We had a blast and basically become bird watching experts and then we never went bird watching again. Oh your cousin with the View Master. I had no idea what those were called but I loved them soooo much!!!! Brings back memories.